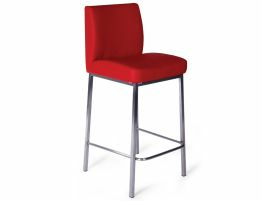 Stylish and sleek, the Addison bar stool provides contemporary styling and remarkable comfort. Crisp, classic white upholstery over a plush cushion lends softness and works with any color palette from classic neutrals to bright, modern hues. A sturdy, brushed, stainless steel frame completes this contemporary piece. 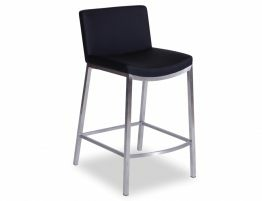 Pair this modern stool alongside your modern stainless steel appliances for a coordinating look. 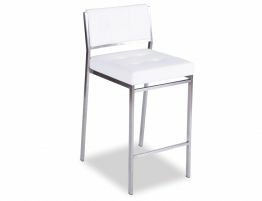 We have used a high quality, white leather like material that feels supple but is so easy to care for. 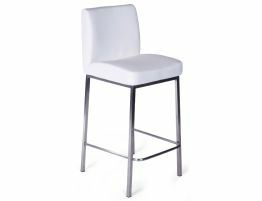 Resistant to stain and easy to wipe clean, the Addison Bar stool is ideal even in high traffic kitchens. 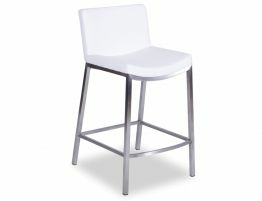 Don’t let your family kitchen suffer from drab design because you fear white stools may not stand up to regular use. The Addison also features an ergonomic seat and supportive backrest that is tall enough to make the Addison bar stool incredibly comfortable. In the war between comfort and style, a truce has been declared! The Addison’s built to last frame is constructed from Premium grade brushed stainless steel giving it a decidedly modern aesthetic that will work as well in your breakfast bar as it will in your busy restaurant. The stainless steel construction lends the Addison an expensive and sturdy feel that you don’t get with light weight chrome counterparts. Protective pads cover the base of each leg preventing the stool from creating unsightly scratches on your flooring.